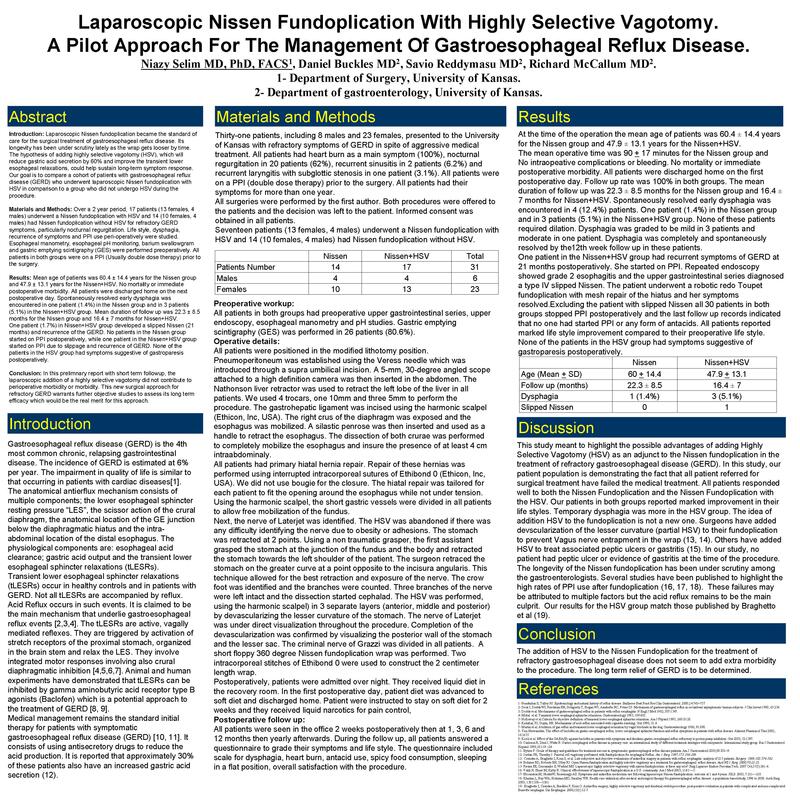 Laparoscopic Nissen Fundoplication with Highly Selective Vagotomy. A Pilot Approach for the Management of Gastroesophageal Reflux Disease. Introduction: Laparoscopic Nissen fundoplication became the standard of care for the surgical treatment of gastroesophageal reflux disease. Its longevity has been under scrutiny lately as the wrap gets looser by time. The hypothesis of adding highly selective vagotomy (HSV), which will reduce gastric acid secretion by 60% and improve the transient lower esophageal relaxations, could help sustain long-term symptom response. Our goal is to compare a cohort of patients with gastroesophageal reflux disease (GERD) who underwent laparoscopic Nissen fundoplication with HSV in comparison to a group who did not undergo HSV during the procedure. Materials and Methods: Over a 2 year period, 17 patients (13 females, 4 males) underwent a Nissen fundoplication with HSV, and 14 (10 females, 4 males) had Nissen fundoplication without HSV for refractory GERD symptoms, particularly nocturnal regurgitation. Life style, dysphagia, recurrence of symptoms and PPI use peri-operatively were studied. Esophageal manometry, esophageal pH monitoring, barium swallowgram and gastric emptying scintigraphy (GES) were performed preoperatively. All patients in both groups were on a PPI (Usually double dose therapy) prior to the surgery. Results: Mean age of patients was 60.4 ± 14.4 years for the Nissen group and 47.9 ± 13.1 years for the Nissen+HSV. No mortality or immediate postoperative morbidity. All patients were discharged home on the next postoperative day. Spontaneously resolved early dysphagia was encountered in one patient (1.4%) in the Nissen group and in 3 patients (5.1%) in the Nissen+HSV group. Mean duration of follow up was 22.3 ± 8.5 months for the Nissen group and 16.4 ± 7 months for Nissen+HSV. One patient (1.7%) in Nissen+HSV group developed a slipped Nissen (21 months) and recurrence of the GERD. No patients in the Nissen group started on PPI postoperatively, while one patient in the Nissen+HSV group started on PPI due to slippage and recurrence of GERD. None of the patients in the HSV group had symptoms suggestive of gastroparesis postoperatively. Conclusion: In this prelimnary report with short term followup, the laparoscopic addition of a highly selective vagotomy did not contribute to perioperative morbidity or morbidity. This new surgical approach for refractory GERD warrants further objective studies to assess its long term efficacy which would be the real merit for this approach.